High School sailing closely parallels the collegiate sailing format and all teams training in the local area are part of the Interscholastic Sailing Association (ISSA). This region is a part of the South East Interscholastic Sailing Association (SEISA). High School sailing is a co-ed sport mostly conducted in double-handed boats, Flying Juniors (FJs) and C420s, with some single handed laser sailing. Local high school sailing teams are sanctioned under both ISSA and SEISA and compete in regularly scheduled local, regional and sometimes national events. Teams participate in a number of regattas throughout the Fall and Spring seasons. The Fall season runs from approximately September 1 to December 15 and the Spring season from mid-January to Memorial Day weekend in May. The end of each season culminates in a District Championship and in the Spring, for those teams that qualify, the National Fleet Racing Championship (Mallory Cup) and National Team Racing Championship (Baker Cup). Racing is typically conducted in double handed boats, either Flying Juniors (FJs) or Collegiate 420s (C420s). For fleet racing, teams are divided into A and B divisions comprised of different skippers and crews for each division. Teams may substitute sailors as long as prescribed substitution rules are followed. Short courses are used, typically windward-leeward with a gate. Course completion times average 15-20 minutes. Generally only 1 fleet is on the water at a time. Two races are completed, then divisions switch, and the boat being sailed by each team is rotated. This allows for coaching and a break. Boat rotation eliminates the possibility of any team having an unfair advantage because of differences in each boat. In Team Racing events, each team fields three boats to sail against three boats from another team. Teammates work together to outmaneuver the other team, using the racing rules of sailing so that their combined race scores are better than the other team’s combined scores. Bay Access Sailing Foundation is a 501(c) (3) charitable organization which owns a matched fleet of 18 Flying Junior boats. Bay Access charters its fleet of boats to high school teams who wish to participate in high school sailing. Bay Access assists in scheduling and providing regular coaching to registered teams. Because the boats must be maintained as a matched fleet for competition purposes, there are some restrictions on use of the boats and boat usage must be coordinated. The Bay Access Sailing Foundation fleet is stored at Lakewood Yacht Club on a floating dock. As few as 2 sailors from a single school can make a team that is eligible to compete in local events. However, to make a team that can compete in all regional and national events, a school needs a minimum of 4 sailors (2 skippers, 2 crew). Ideally each team has 4 sailors or more. 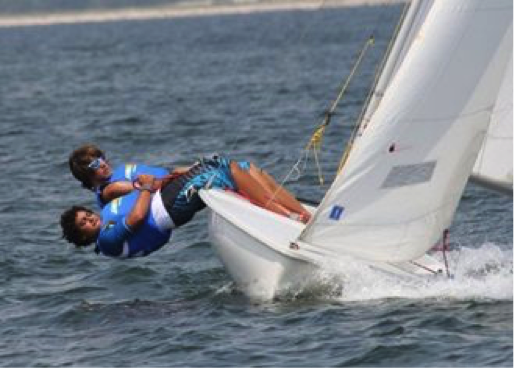 Racing experience is not required to participate in high school sailing. Youth who are new to sailing are welcome, though a new sailor should expect to participate as crew rather than skipper until his or her sailing skills have reached an appropriate level. Usually, not all sailors are likely to sail at every regatta. Each team will need at least one adult volunteer to serve as a liaison between Bay Access Sailing Foundation and the school team. Each co-ed team will also need at least one adult male volunteer and one adult female volunteer as a chaperon for travel events. Each school team establishes its own rules for practice attendance, regatta attendance, regatta team selection, minimum standards of conduct, grade standards and the like. Gear can be purchased at KO Sailing which is located at 2321 Nasa Pkwy in Seabrook. What if you do not have a team or your team is too small? Rules for school teams vary from district to district and at private schools. Please contact the Bay Access Sailing Foundation HS Coach for assistance in organizing a recognized high school sailing team at your school district or private school. If you do not have enough students at your school interested to form a full team, you can still participate in practices and in any high school regatta that is strictly local or an open regatta. Sailors will be paired with other students who are also without a full team. Each regatta has an NOR (Notice of Race) document that lists the eligibility requirements of the regatta. The SEISA rep can help you determine what regattas you can sail in. Bay Access Sailing Foundation requires parental leadership and supervision for each team. The ISSA website provides some helpful outlines of the various critical functions. Each team would need a parent lead as well as an adult present at any regatta. Practices are never canceled due to inclement weather (except perhaps for a named storm). Students will still conduct fitness training and classroom learning (strategy, rules, boat handling theory, knot tying, rigging and basic boat maintenance).